HcL is a registered charity and relies on funding from the Local Authorities in which we operate and Trusts, Funders and local donations to deliver our services. The vital support we provide people with mobility needs would not be possible without our generous supporters. We continually seek additional funding to renew our vehicle fleet, to expand our fleet and services and to pay for new equipment and projects. We welcome financial help from trusts, individuals, local organisations and commercial bodies. Are you able to host a fundraiser for us? A pub quiz, a coffee morning, a sponsored walk? Maybe you would like to run a 5k, 10k or a marathon to help keep our services going? We are delighted to accept financial donations to support our work. Please click on the link below, or contact us directly. If you register with easy fundraising and choose Handicabs Lothian, we will get a % of what you spend on numerous websites donated to us, at no cost to you. It is easy to register, then click on the reminder and every time you go on a website that will donate a percentage of your sale to your chosen charity, it reminds you so that we do not miss out. It is really simple to do! And if you shop on Amazon and register with Smile – we get 0.5% of what you spend. Again at no cost to you. Go to the website smile.amazon.co.uk and select Handicabs as your charity, we will get 0.5% of everything you spend. This will mount up over the year and be a great help to us. We can claim gift aid on many of the donations we receive. For donations under £20 we do not need any paperwork but if a donation is over £20, we would need a completed form. Please let Laura know at laura.kearney@handicabs.org.uk or mention next time you book your journey if you would like a form. Thanks! Can you consider leaving a lasting legacy by remembering HcL in your will? Any gift, large or small, will help to safeguard our vital work. We have a number of bus naming competitions this year so please get in touch if you would like to find out more about naming a bus! Is your business or organisation is interested in sponsoring HcL or partnering our work? Could HcL be your ‘Charity of the Year’? Would you like to sponsor a bus? We can include your logo or organisations name on the vehicle to show your support for our services. We would be delighted to come and speak to your staff or group and tell you more about our services. We are very grateful to the following funders and organisations that have supported us in recent years. Morrisons Charitable Foundation has supported HcL with funding for the purchase of a vehicle. 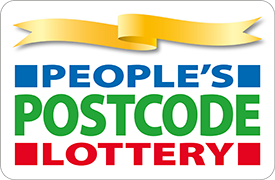 The Postcode Community Trust has supported HcL with awarding funding towards the cost of one of our vehicles. St John Scotland has supported HcL with awarding funding towards the cost of our vehicles and running costs. The Robertson Trust has supported HcL with awarding funding towards the cost of one of our vehicles.